Santa Monica Canyon was a resting place for the area's early landowners. Among them were the Marquez family. While I am not sure if this Marquez family is one of the early Converso families - although many, of the early settlers did have Converso backgrounds - the name is documented as a Jewish family name in Pere Bonnin's Sangre Judia, which lists thousands of Jewish family names mentioned in pre-Inquisition and later court and other documents. Among them are MARQUES (1487, Zaragoza), MARQUEZ (1634, Toledo) and MARQUESSI (1476 Castellon). In any case, this LA Times story focuses on learning the boundaries and burial locations of the historic Marquez Family Cemetery - one of the city's oldest burial grounds - and the only portion of the original Mexican land grant in the family's hands. It is located south of the Riviera Country Club, for those who know the area, on San Lorenzo Street, north of San Vicente. The link has a map. Francisco Marquez established a burial ground on the canyon's mesa in the late 1840s. He was the Mexican co-holder of the Rancho Boca de Santa Monica land grant. Buried there are his youngest son Pascual and some 30 other relatives. This includes 13 guests at a 1909 New Year's Eve party, who died from botulism in home-canned peaches. In 2000, the site was named an extremely historic landmark by Los Angeles. Last week, technology arrived at the cemetery as scientists brought ground-penetrating radar imaging equipment to see exactly where the bodies are buried. Joining them were students at UCLA's Cotsen Institute of Archaelogy. And, on January 31, special dogs from northern California's Institute for Canine Forensics will see if they can sniff out any remains. All of this is focused on finding the cemetery's boundaries and burial locations so preservationists (including Pascual's grandson Ernest) can develop a restoration plan and open the site to the public. Some costs are being funded, along with contributions by foundations and neighbors, by the nonprofit La Señora Research Institute de Rancho Boca de Santa Monica. "I want to keep it in its natural state and not modernize it in any way," said Ernest Marquez, 84, a local historian who grew up in Santa Monica Canyon and lives in the San Fernando Valley. "When you come here, you are transported back to rancho days. There's an aura here that you don't get anywhere else. "Today the burial ground, overgrown with weeds and missing all but two of its grave markers, sits tucked away behind a rustic wooden fence on San Lorenzo Street. Few people know it's there. The site is surrounded - landlocked - by the many houses that were eventually built in the canyon. Ernest's book, "Santa Monica Beach," details that, in 1839, the Mexican government gave the land grant to what would become portions of Santa Monica and Pacific Palisades to Mexican citizens, Francisco Marquez and Ysidro Reyes, who began cattle ranching on their more than 6,500 acres. They build adobe homes and raised their families. The nearest Catholic cemetery was a day away, so Marquez set aside land for a burial site. The story includes genealogical information: Pascual, in 1879, married Micaela, daughter of Reyes, and the property and the marriage united two families. They had 10 children. Pascual was the last to be buried there, in 1916, near the adobe in which he was born in 1844. In the mid-20s, the land was sold to the Santa Monica Land & Water Co., owned by Robert Gillis. The canyon was subdivided for homes and Gillis' daughter urged her father to protect the cemetery. An adobe wall was built to surround it. The story addresses access problems to the landlocked (by privately owned parcels) cemetery. Family members used a 4-foot-wide easement that runs from the center of the cemetery's front wall to San Lorenzo Street. In 1952, last owner of record Pedro Marquez, died, with the site passing to heirs who recently gave the property to Ernest. It is hoped that the scientific investigation will lead to more interest concerning the site. According to Woodland Hills geophysicist Dean Goodman, who is helping with the mapping, 3-D data reveals at least four possible areas of unmarked remains that should be tested. "We also see something that looks like the original adobe foundation," Goodman said one recent morning at the site. Goodman has previously surveyed ancient buried wall foundations in Vescovio, Italy; a buried garden pond at the villa of Roman emperor Trajan; Genghis Khan's palace in eastern Mongolia; imperial family tombs in Osaka, Japan; and the Presidio in San Francisco. Much remains to be done before the site can be restored. But supporters envision grave markers, pathways and lovely landscaping. Nettleship added that "We've lost track of our history," she said. "We need to make the next generation aware of the value of knowing the history of those who came before us." Do read the complete article at the link above. There are photographs and a map of the cemetery's location as well. In Canada, Quebec City's Jewish Cemetery records are now online at ShalomQuebec, under the Families tab, along with a plan of the cemetery and lists of family names. There's also a very nicely done timeline of Quebec's Jewish history. Since Jewish immigration was not officially encouraged in New France, there is no proof today as to the existence of a Jewish community in Québec City during that period. Nevertheless, we can still make the hypothesis that some Jews came to Québec City under the French regime without necessarily declaring their origins. There is proof that in 1738, a young Jewish woman arrived at the port under a false identity, named Esther Brandeau. She was sent back to France the following year after an attempt at conversion. At around the same time, in 1748, a shipowner of Sephardic origin living in Bordeaux, Abraham Gradis, formed a company aimed at ensuring a supply of soldiers and arms for New France, the Société du Canada. He continued his work until Québec City fell, but without ever coming to the colony. His merchant ships were the only ones to make it to America during the last days of the French colony. Gradis was the last person to personify France's determination to maintain its American colony. To see the cemetery plan, click on the Families tab, and see cemetery plan (as a PDF) at the bottom right. Scroll all the way down. The cemetery plan and photos are indexed by surname. There are some tombstone photos - not every family listed has photos of the stones - and see them by clicking the family name and personal name. Click on the photo of either people or stones to see an enlarged view. Thanks to Merle Kastner of the Jewish Genealogical Society of Montreal for the link to this resource. For more information on Shalom Quebec, see Tracing the Tribe's post here. 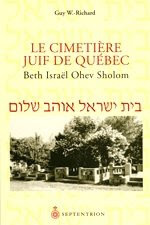 Guy W. Richard did the original research for this, and his book, Le Cimetière juif de Québec Beth Israël Ohev Sholom, is published by Septentrion. Un cimetière juif à Québec? L'existence d'un tel lieu a de quoi éveiller la curiosité, car il témoigne de la présence à Québec d'une communauté juive aujourd'hui dispersée. 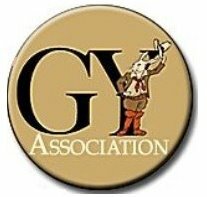 Guy W.-Richard, gouverneur de la Société de généalogie de Québec et maître généalogiste agréé, s'est prêté au recensement des stèles de ce cimetière. Le résultat de ce travail de moine est un livre vivant et envoûtant qui ressuscite la vie de la communauté juive à Québec. Peu connue, cette dernière n'en fut pas moins la troisième en importance au Canada au milieu du XIXe siècle, derrière Montréal et Toronto. L'auteur présente une retranscription des épitaphes gravées sur les pierres tombales. Il y ajoute des détails biographiques sur les personnes inhumées, leur conférant une personnalité qui les rend attachantes. Dans les premières pages du livre, une brève histoire de la diaspora, de l'implantation des Juifs au Québec et de la communauté juive de Québec replace le lecteur dans un contexte plus large. Ce dernier peut alors pénétrer dans l'univers enchanteur du cimetière de Beth Israël Ohev Sholom et découvrir un aspect fascinant du patrimoine québécois, reconnu par la Commission des lieux et monuments historiques du Canada. Ready for a good mystery? The Intermountain Jewish News has just published an excellent Jewish mystery tale. Here lies a tale about the past, and the mysteries in its wake. Sit down, have some hot tea, stir the fire, make yourself comfortable on a cold winter’s night. Hear a story about events long ago transpired, people long since dead, and old tombstones mostly — but not entirely — forgotten. A tale of the cemetery, and those who repose within it. Not a spooky tale, mind you, although to many people cemeteries are spooky places. And not necessarily a sad tale, although most of us find graveyards to be forlorn and gloomy locales where grief and regret reign supreme. No, this is a tale about lives lived, accomplishments achieved, decisions made — and questions asked. A story about histories. And mysteries. A young Denver woman, Jennifer Miklosi, was working on her master's in art history at the University of Denver some 10 years ago, working under Dr. Annette Stott, head of art history at DU. Miklosi says it began as a course assignment with the focus on 19th century sculpture in cemeteries. She was to find a piece and analyze it from an art historian's perspective, write an artistic analysis and uncover as much of its history as possible. It was a marble statue, in the form of what experts on the esoteric topic of cemetery sculpture call a “woman in mourning,” a female figure, wrapped in a shawl, holding a wreath of flowers and looking plaintively toward the grave below. The figure’s right hand is wrapped around the cut-off trunk of a small tree. Miklosi was taken by the life-like expression on the figure’s face, by the realistic texture and wave of her hair, by the intricate details apparent in the hem of her shawl and the flowers in her wreath — in general, by the overall artistic excellence of the piece. Miklosi says both the“woman in mourning” theme, and the cut-off tree — often used for a young person whose life was cut short — are seen in sculptures at Fairmount and other cemeteries. What caught her eye was the superior workmanship, it wasn't a mass production piece like many others - so she thought it might have been commissioned. While mourning woman figures are found at Christian graves, there is usually a horizontal branch on the tree, creating a cross. This sculpture had no such branch and was an enigma. There was no indication of the sculptor anywhere, and the cemetery office had no information. That's when Miklosi set to work as any conscientious art historian - investigating the family who owned the plot. Along the way, she became something of an art detective in pursuit of history - family history. The young woman was Jessie Eleanor Salomon who died at the age of 19 on January 8, 1889. She was the daughter of Hyman and Cecelia Salomon, whose graves are included in the sizable family plot at Fairmount, as are those of her siblings Eva, Oscar, Florence and Lillian, and a man, James Geoffrey McMurray, who is assumed to have been her brother-in-law. Eva and Oscar both died when quite young; Florence when considerably older; and the couple Lillian and James McMurray, apparently at an advanced age in the 1920s. The plot holds individual tombstones for all family members interred there, plus a large central granite memorial, adorned only by a single Old English “S” and the family surname. The statue which stands at the head of Jessie’s grave is the only sculpture in the plot. No other graves, including those of her parents, boasts such a distinctive marker. And, as suitable for the International Jewish Graveyard Rabbit, the Salomon family was Jewish, as Rabbit readers have already guessed. Miklosi isn't Jewish and never studied local Jewish history, but her passion for this investigation turned her into an authority. Like a good genealogist, she checked old newspapers and written histories for the Denver Jewish community and found data on the family's patriarch, Hyman Salomon, who appears in history books. Some historians believe he was the first Jew to settle in the place now known as Denver. Born in Prussia, Salomon came to what was then known as Auraria early in 1859, making him one of the first pioneers to arrive here. His brother Frederick followed close on his heels. In short order, they set up Denver’s first-ever dry goods business, Salomon Brothers, which hop scotched over several locations in its early years. The brothers, in partnership with a Gentile trader by the name of J. B. Doyle, then began opening up general stores in Colorado and New Mexico.With other partners, they also set up wagon trains full of provisions to help supply the new mining camps in Colorado’s high country. They, and a third brother, Adolph, who became a successful potato farmer and merchant in Horace Greeley’s Union Colony in northern Colorado (known today as Greeley) were as authentic as Western pioneers could get. They braved confrontations with restive Indians on the eastern plains, rode hundreds of miles on horseback to distant locations, helped set up mining camps that would later become gold and silver boomtowns and outfitted US Cavalry units throughout the region. In addition to setting up what is believed to be Denver’s first brewery, the Salomons were able to bring to the fledgling settlement of Denver both cigars and whiskey, the latter said to be considerably superior to the notorious “Taos Lightning” previously available. The Salomons made lots of friends among Indians and white men alike, and gained reputations as plain dealers and straight shooters (denoting honest traders, not accurate gunslingers). Such terms constituted high praise indeed in the days of the Old West. Along the way they also made lots of money with their skills and timing. Hyman and Frederick became respected citizens. Both were were proud of their Jewish heritage, helping to found the Hebrew Burial and Prayer Society, which organized Denver’s first Jewish cemetery and later evolved into the city's first synagogue, Congregation Emanuel, whre they were among the founding members. As she uncovered information she found a letter from Hyman published in the Rocky Mountain News in 1865, in which he criticized then-territorial governor Alexander Cummings on a Thanksgiving proclamation he had issued, stressing the holiday's Christian roots. So, she learned that his Jewishness was important to Hyman, but here now was the mystery. Why would such a respected Jew have his and his family's graves in a section other than the Jewish part of Fairmount Cemetery? His brothers Frederick and Adolph were in the Jewish section, but Hyman's is in the general section - with very few Jewish graves. Well, there was more, continues the story, at least five of the plot's graves were originally in the old City Cemetery, but were moved when the city decided to redevelop the land. The Salomon graves were moved to Fairmount on April 4, 1916. Hyman’s widow, Cecilia, apparently paid for the new plot and arranged the move, although Fairmount records do not mention Jessie's statue. There's much more, including a list of further questions that need to be answered to understand the full picture. The Denver Public Library Western History section has no record or photograph of Jessie in any newspaper article or obituary. The newspaper is asking for help from the readers of the story. It is possible that descendants of Hyman Shapiro (or more likely, his brother Adolph) still reside in Colorado and might possess a few family anecdotes that could shed light on the many mysteries of the grave. Such individuals are encouraged to contact the newspaper, no matter how hazy or folkloric the recollections might be. Please read the rest of this particularly fascinating mystery of history at the link above. Let me know if you have any information that can help solve this case. 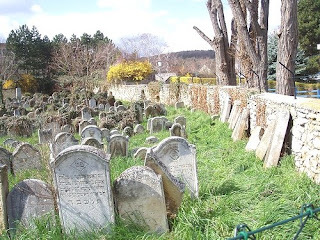 Ruth Ellen Gruber's posting at JewishHeritageTravel covers emotional and mystical experiences at Jewish cemeteries, both her own and of others. Visiting a Jewish cemetery in Europe, and particularly in East-Central Europe, can be an emotional experience. This holds true whether you go there as a volunteer helping clean up an abandoned cemetery overgrown by weeds and trees, or as someone on a roots trip looking for a long-lost, or long-forgotten, family grave, or as a "straight" tourist interested in history or the powerful imagery of tombstone art. In the introductory chapter of Jewish Heritage Travel: A Guide to Eastern Europe I addressed these emotions, describing how I myself felt when I began exploring these sites. I became absolutely mesmerized, even a little obsessed with what I was seeing. I wanted to visit, touch, see, feel as many places as I could. I almost felt it a duty. As I entered broken gates or climbed over broken walls into cemeteries where a Jew may not have set foot in years, I wanted to spread my arms and embrace them all, embrace all the tombstones, all the people buried there, all the memories. In the first editions of the book, I added a further sentence, describing how I projected my thoughts toward these all so often forgotten places: I'm here, I told them mentally; SOMEONE is here. Back then, my trips were voyages of discovery. Everything was new; there was little literature on the subject, few visitors had made their way to such sites, and there were few efforts to preserve, maintain or restore them. But even today, after scholars and genealogists and tour guides have studied and mapped and documented almost everything -- I still feel the pull. Ruth continues on to detail a Jerusalem Post story by Jonathan Gillis who took part in a restoration project of the Czestochowa (Poland) Jewish cemetery and his experiences. She includes photos (1991, 2006) of the old Jewish cemetery cemetery in Nazna, Romania - near Targu Mures - and describes her almost mystical experience there. Read Ruth's complete post at the link above. The Stockholm (Sweden) News Online in English reported that on the morning of January 13, Molotov cocktails were thrown inside and outside the funeral chapel at the old Jewish cemetery in the city of Malmö, south Sweden. No one was injured and the emergency service quickly got the fire under control. Police have made some findings at the scene. There are more details at The Local (Swedish News in English). JewishHistory.com has an entire section devoted to the Cemetery for Hebrew Confederate Soldiers. According to the site, the Shockoe Hill cemetery in Richmond, Virginia - maintained by Congregation Beth Ahabah - is the only Jewish military cemetery in the world outside the state of Israel. 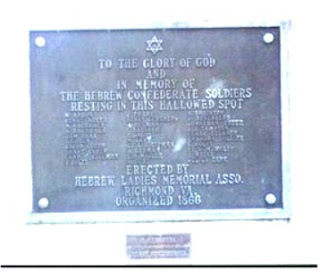 A plaque erected in 1866 by the Hebrew Ladies Memorial Association of Richmond, holds the names of those Jewish soldiers who died during the Civil War. G. Wolfe, N.C.I. Hessberg, Caroline co.
M. Aaron, N.C.A. Lehman, S.C.
Lieut. W.M. Wolf, Hagood's S.C. Brigade, died May 9, 1864. H. Jacobs, S.C.E.B. Miller, died April 6, 1864. Captain M. Marcus, 15th Georgia, killed October 13, 1864. The site has many very interesting resources - take some time to look around. Here's photographer Trix Rosen's essay - and wonderful photographs - on her August 2008 trip to Ukraine. I learned about Rosen in a posting by Ruth Ellen Gruber, with a link to Gruber's own photos of Ukraine. Rosen used Gruber's book, Jewish Heritage Travel: A Guide to Eastern Europe, to organize her trip. For me, a first-generation American, an artist, a photojournalist, and a historical preservation photographer, they have become a portal to rediscovering my own Jewish heritage. She offers evocative photograph, arranged in albums, of the cemeteries located in Chernivtsi, Sadhora, Shahhorod, Kremenets, Sataniv and Medzhybizh. I could see hundreds of stones jutting out of the hills in all directions, leaning this way and that like silent figures pushing out toward the sun. In the distance, the worn grey, beige and brown graves were stark monuments, reminders of the people who had lived out their lives in this place, and died. The cemeteries seemed to be swallowed up by nettles, wildflowers and hills of exuberant goldenrod. Where the ground had shifted, the displaced stones appeared as monoliths from some ancient civilization, left by time to lean against one another. In August 2008 I travelled to the Ukraine for the first time, to meet two of my friends and to visit Odessa, the birthplace of my father. My two-week visit became an exploration into the history of the once vast community of Eastern European Jews and the relics they had left behind. She describes the tombstones and their carvings of animals and symbols. The cemeteries - called Bet Hayyim (Hebrew for House of Life) - survived pogroms and Nazi murders of Jews who lived nearby. Read the complete essay at the link above. Arlene Fine of the Cleveland Jewish News is doing a series on women with unusual occupations. This Friday, it was the turn of Karen Gutner of Classic Monuments, who helps families select and personalize headstones. After they get over their uneasiness, most of Gutner’s clients have sticker shock. The average headstone can run anywhere from $500 to $5,000, and that does not include the cemetery fee for the cement installation to hold the headstone in place. But that is not the only issue people must consider. 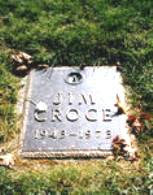 Every cemetery or cemetery association has rules as to the height and width, color and shape of a tombstone. Gutner keeps a handbook listing all requirements and restrictions as a verifiable reference. After a headstone is selected, the wording can be the next hurdle. Gutner says that in the case of a woman who has married more than once, the choice of wording can be a problem when everyone gets into the act (children, stepchildren, surviving husband/s or parent/s) as to what names will appear on the stone. The article ends with Gutner's pleas for individuals to visit a memorial business and pre-pay for the tombstone when prepaying for a funeral. 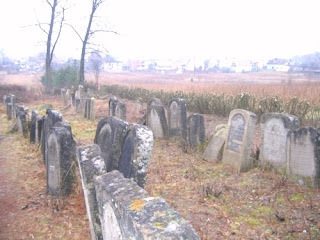 Ruth Ellen Gruber writes in Jewish Heritage Travel about the clean-up project in the Jozefow Bilgorajski Jewish cemetery in eastern Poland. The project was co-financed by the Foundation for the Preservation of Jewish Heritage in Poland (FODZ) and the Polish Ministry of Culture and National Heritage. Ruth has posted her own photographs, and FODZ has also created an online photo gallery of the results. Jews settled in Jozefow in the 18th century, and by 1921 nearly 80 percent of the local population was Jewish. A very nice baroque-style synagogue, built in the late 18th or early 19th century, now serves as the town library. The oldest tombstones in the cemetery date from the 1760s. I visited there in the summer of 2006, when I was doing the updates for Jewish Heritage Travel. The local librarian was very helpful, giving me explicit instructions how to find the cemetery, located near quarries on a hill just outside town. Access is via a dirt road off Kamienna street. Parts of the cemetery were - sort of - clear, or at least fairly accessible, even in "high weed" season. But much of the cemetery was jungle.... Here are some photos to compare how it was, with the pictures on the FODZ site showing the area after clean-up. Do visit Ruth's blog to see her photographs. Follow the links for more information. The tiny town of Eisenstadt means different things to different people. There can be strange juxtapositions in the study of Jewish cemeteries and genealogy. Here you will find at least four: the composer Joseph Haydn; the Esterházy family, a world-renowned potter and an ancient Jewish community in Eisenstadt in the Burgenland (Austria). Joseph Haydn was born in Rohrau (Lower Austria) on March 31, 1732, and died in Vienna on May 31, 1809. I am such a Haydn fan that I visited his birthplace a few years ago, at the exact day and moment of his birth - I was the only visitor! Haydn was often a reluctant resident of Eisenstadt as he and his musicians had to spend the summer there; Haydn was employed to compose “to order” and play almost daily to entertain the Esterházy court and its many visitors. It was the same Count Nikolaus Esterházy who was the Schutzherr of the Jews of Eisenstadt, who lived within the castle estate. After Vienna, Haydn found Eisenstadt very tedious as it was so small and restrictive. When Count Nikolaus died, the composer went to London and was in seventh heaven. Haydn was awarded the first-ever Honorary Doctor of Music at Oxford and I too have an Oxford degree and have trodden in his footsteps in that historic University town. If you have never listened to Haydn’s Creation - based on the Old Testament account of the seven days of creation - and his secular oratorio, The Seasons, you are in for a treat in 2009, the 200th anniversary of Haydn’s death. It is not generally known that Sandór Wolf - his Eisenstadt house is now a regional museum and houses one of Haydn's gorgeous organs - was the grandfather of the world-renowned potter Lucie Rie. See photos in my FLICKR site here. Sándor Wolf (Eisenstadt Nov. 21, 1871 - Haifa Jan. 2, 1946) was a wine wholesaler, art collector and researcher. He was also a scholar/archaeologist and collaborated with Bernhard Wachstein - click here for more information - in a momentous tome on the transcriptions of the Eisenstadt cemetery: “Die Grabinschriften des alten Judenfriedhofes in Eisenstadt mit einer Studie: Die Entwicklung des jüdischen Grabsteines und die Denkmäler des Eisenstädter Friedhofes von S. Wolf (Eisenstädter Forschungen 1). Wolf was particularly interested in ancient settlements and artefacts of the Burgenland and there is evidence that Jews had arrived in this area with the Roman Legions, well over 1,000 years before the first Jewish community settled in Eisenstadt in the 1370s. The Esterházys took the Jewish community under their protection in 1622 when they inherited the area estates. The Jewish population increased and the fame of tiny Eisenstadt as a centre of Jewish learning and scholarship spread throughout the world. In 2008, a gold scroll was discovered in the Burgenland, as the earliest evidence of Jewish inhabitants in the region, now part of Austria; the amulet was inscribed with a Jewish prayer and found in a Roman child’s grave dating back to the 3rd century at a burial ground in Halbturn. Read about these here. There is a WOLF GOMPERZ RIE family archive here with many pictures. Lucie Gomperz was the youngest child of three and the only daughter of Dr. Benjamin and Gisela Gomperz. Dr. Gomperz was a successful ear, nose and throat specialist in Vienna. Gisela Gomperz née Wolf was born into the wealthy Wolf family. The Gomperz children, who lived in Vienna, spent a lot of time at the Wolf estate in Eisenstadt. Here is an excellent German-language article with photographs about this fascinating family, and a family tree here. Burials in Eisenstadt cemetery illustrated here took place from 1679-1874. There is a later Jewish cemetery I did not visit on this trip. Eisenstadt was called *Asch* in Hebrew because the two Hebrew letters A(lef) and S(chin) are derived from E(A)eisenStadt. Thus, Asch may imply the family name Eisenstadt or an origin from Eisenstadt viz: Meir b. Isaac Eisenstadt [MaHaRaM A"Sh]. Finally, look at my FLICKR pictures here. International Jewish Graveyard Rabbit is happy to introduce new contributor Ellen Shindelman Kowitt. She is the webmaster for the Jewish Genealogical Society of Colorado. A former IAJGS board member and past president of JGS Greater Washington, she lectures and writes about Jewish genealogy. Jews arrived in Colorado with the Gold Rush in 1859. 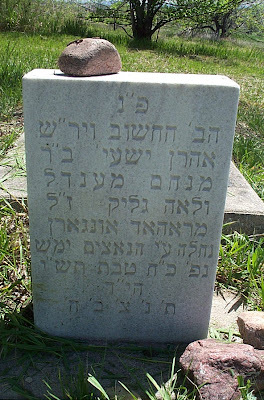 The oldest Jewish burials in Denver were conducted by the pioneer organization, the Hebrew Burial and Prayer Society (later known as the Hebrew Cemetery Association) from 1860 to 1910 and were interred at the Denver Pioneer Cemetery “Old Jewish Section” located east of Cheesman Park on Capitol Hill. Most Jewish remains and gravestones there were moved to the nonsectarian Riverside Cemetery and to the Jewish Fairmount, Golden Hill and Rose Hill Cemeteries in the early 1900s due to urban development. At the time, common treatment of tuberculosis called for "freezing the disease out of them with access to fresh Rocky Mountain Air," and patients lived in these unheated buildings. In Denver cemeteries, many Jewish burials circa 1899-1954 were of those who travelled to two Colorado Jewish sanitariums for the treatment of tuberculosis. National Jewish Hospital opened in 1899, and catered largely to Jews with a less severe case of tuberculosis who were of German background and more assimilated. The Jewish Consumptives Relief Society (JCRS) served those with advanced stages of the disease and who were recent Russian immigrants. JCRS was a kosher facility with an onsite synagogue, and the patients were often observant. 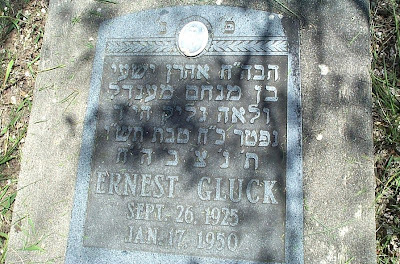 The English name reads Ernest Gluck, whose Hebrew name and father's name are Aharon Yeshai ben Menachem Mendl. This stone above, with the same details, begins with a note about the Shoah (Holocaust). This second stone might have been erected by his family, particularly since it mentions erasing the Nazis - unrelated to a Colorado tubercular’s grave - but perhaps representative of stones in that generation commemorating others who died in the Shoah elsewhere. This plaque was apparently constructed by his friends at JCRS. Members of the Jewish Genealogical Society of Colorado assisted the University of Denver Judaic Studies Division with the creation of an online JCRS patient surname index. This project was awarded the IAJGS Malcolm Stern Grant in 2003. Copies of JCRS patient applications (click here to see a sample) can be requested and often include birthplace abroad, landsmanshaften affiliation, names and ages of children, nearest of kin and burial location at Denver cemeteries. Rose Hill Cemetery in Commerce City, Golden Hill Cemetery in Lakewood and Mount Nebo Cemetery in Aurora specifically included tuberculosis patient burials. A significant number were buried by benevolent groups as indigent and in unmarked pauper graves. 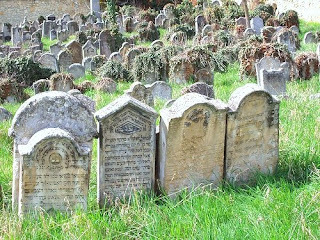 Regardless of whether a gravestone ever existed or has survived, all Colorado Jewish burial data has been gathered from local sources, indexed, entered into the JewishGen Online Worldwide Burial Registry and can be searched by the name of the deceased, cemetery or location. Gravestone inscriptions have been translated into English from Hebrew, Yiddish and Russian. Rose Hill Cemetery: Burials 1892-present; includes tuberculosis patients from JCRS. Mount Nebo Cemetery: Burials 1904-present; includes tuberculosis patients from JCRS. 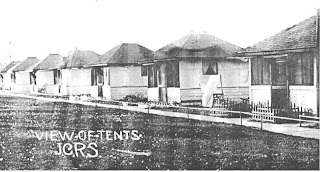 Golden Hill Cemetery: Burials 1908-present; includes tuberculosis patients from JCRS. Emanuel at Fairmount Cemetery: Burials 1911-present.